Nonstop raining day at our West Dayton mobile location. Yesterday was nonstop raining day at our West Dayton mobile location. Our families despite the rain came out to our mobile location. Our families were very thankful, we held our mobile during the storm and didn’t cancel our mobile location. With God’s Grace always hold our mobile regardless of the weather, because we realized just because of bad weather hunger never stops. Yesterday during the rainstorm With God’s Grace provided 120 families with healthy food for their families. With God’s Grace Would like to thank our 21 amazing, dedicated volunteers that came out despite the raining weather to help provide food to families in our community. Our volunteer was cold and wet but never quit smiling and showing love to our families that came through the line. We are so very thankful for each one of you. On this HOT summer day we were at Drexel Church of the Nazarene. Providing food to our families. 144 families received fresh corn on the cob, 2 heads of cabbage, 2 pineapples, 6 choices of packages of fresh produce, 4 dairy items and 25 cartons of milk, 6 breads, 12 non-perishable food items. With God’s Grace would like to thank our 24 volunteers that help fight hunger in the hot summer heat. We are so thankful for our volunteers! 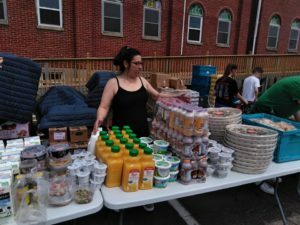 The weather might be hot and humid summer day, but it didn’t stop our families for stopping by to get some help with food in West Dayton. With God’s Grace works very hard to bring as many items of healthy food choices and non-perishables to each mobile locations. 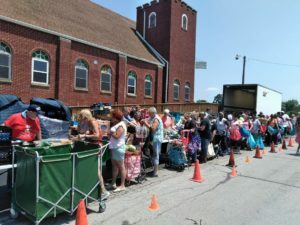 Today 131 families received Watermellons, potatoes, 3 bags of chopped broccoli, 6 packages of fresh produce (they got to choose) 11 items of non-perishable food, 3 items of dairy and cooler items, 1 bakery (they got to choose) and 5 bread ( they got to choose) With God’s Grace would like to thank our 21 volunteers for coming out in the heat and helping fight hunger in our community.